I suppose I am giving some of you a big SHOCK by designing Christmas cards. If you’re surprised about this, it’s because you know I don’t make many cards and have even been known to buy the Hallmark variety…Gasp! 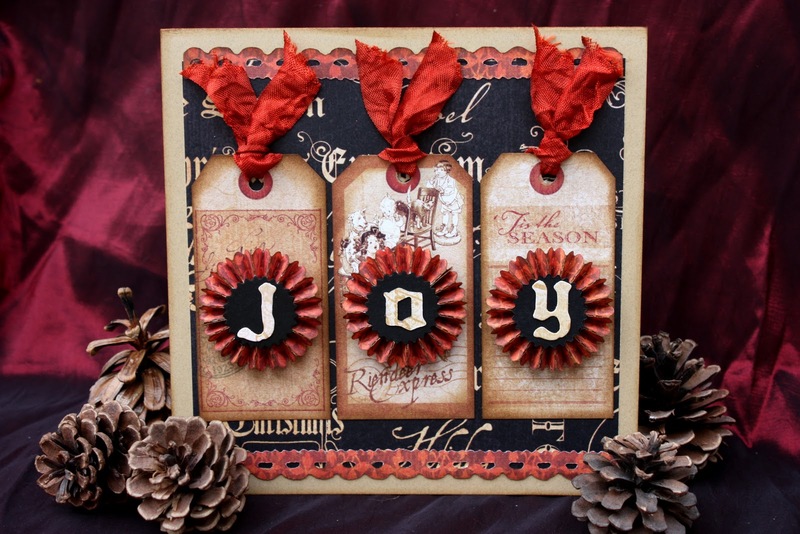 Using the new Graphic 45 Christmas Emporium collection and the Tim Holtz Mini Paper Rosette Sizzix die, I designed 5 cards and thought I’d share a few of the details with you. 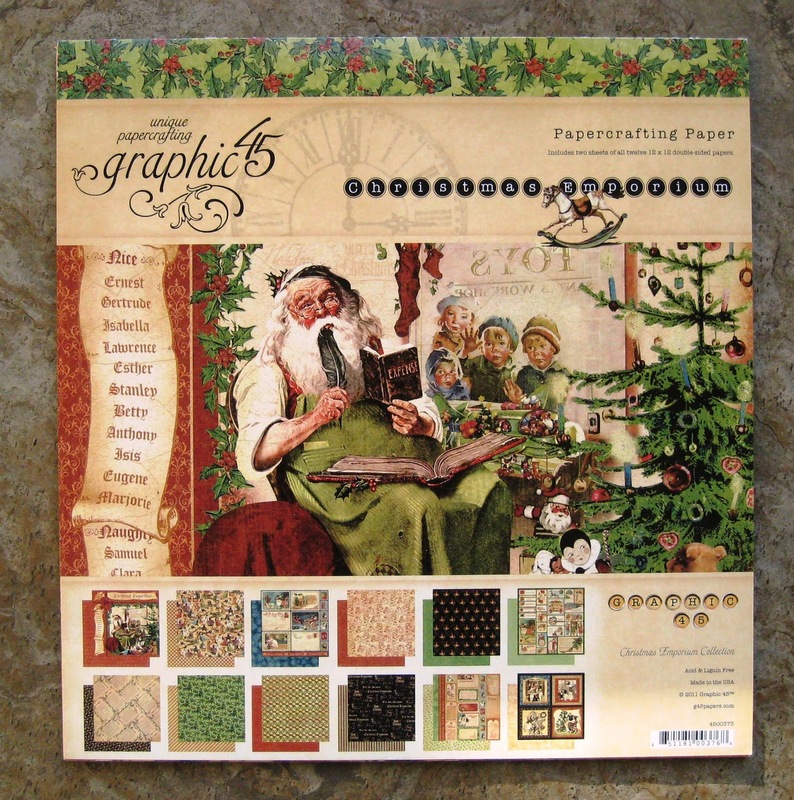 The Graphic 45 Christmas Emporium paper pack…beautiful vintage papers! Here is the first card…. The background is inked and embossed kraft paper, plus I used real Wood Veneer paper (Thin) from Creative Imaginations to design the mantle. 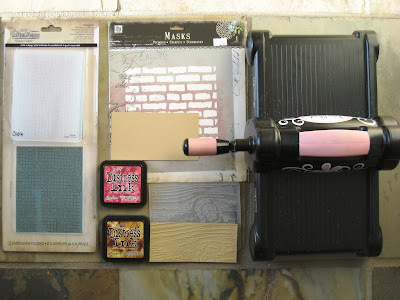 I used Fired Brick Distress Ink and the Prima Brick mask/stencil to alter the piece of kraft paper. 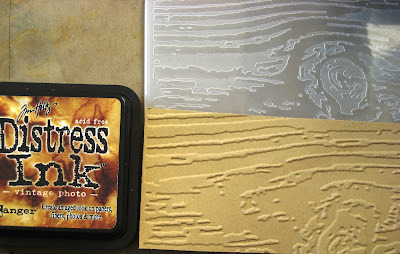 After embossing, I lightly inked the raised design with Vintage Photo Distress Ink. …and inked the raised design again with Vintage Photo. The wreath is made with two medium rosette flower strips attached together. 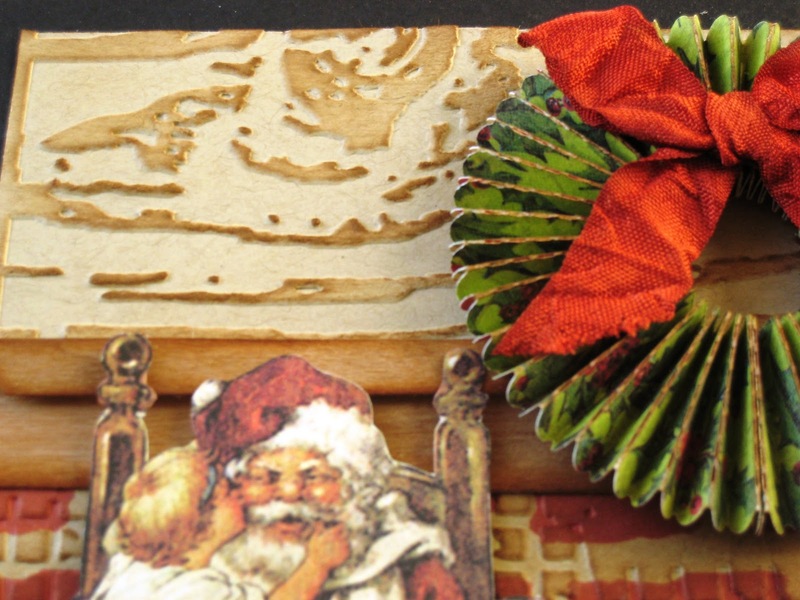 I found it helpful to create a stable base for this wreath to sit on, so I made a “donut” out of scrap paper…. The red ribbon is actually plain cream rayon ribbon (seam binding) coloured with Fired Brick Distress Stain. Crumple it while still wet with the Stain and let dry in a crumpled ball to obtain the worn out vintage look. 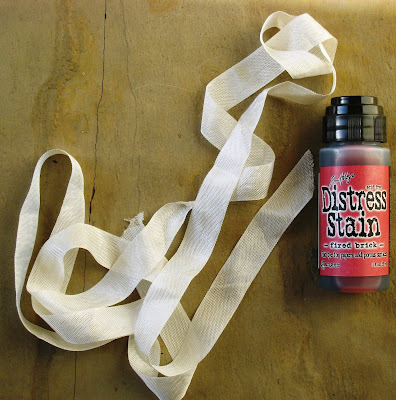 Distress Stains come in so many different colours and allow you to transform any piece of seam binding! I used 3 Tim Holtz dies to create this card…. 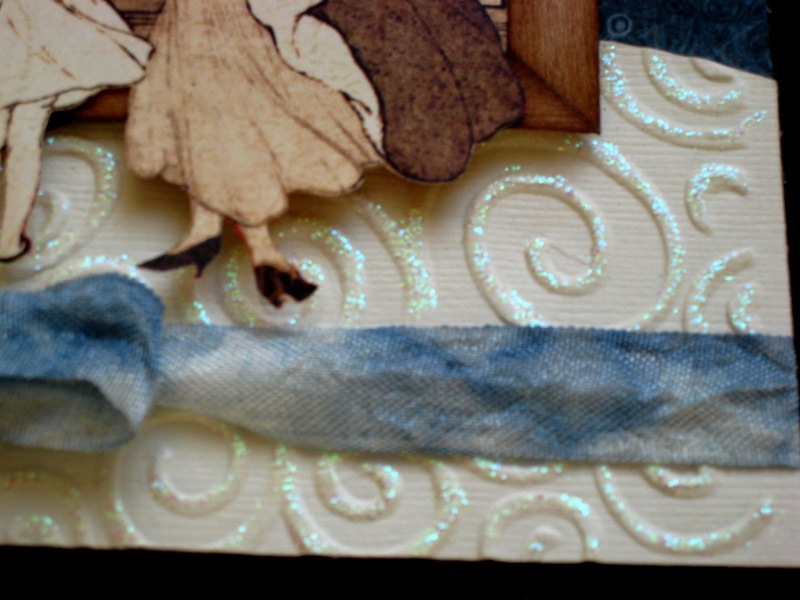 The third card is named “Wishful Window” …. 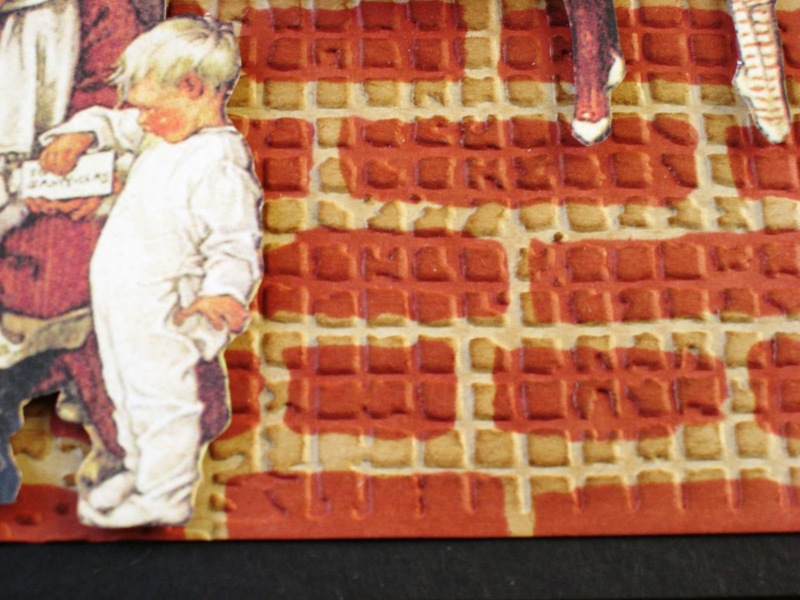 The mother with children looking into a store window is an image from a piece of the Graphic 45 paper, which I fussy cut. Then I framed the window with real Wood Veneer paper, inked with Walnut Stain Distress Ink. The small mini rosette is accordion folded and adhered as an awning across the top of the window. 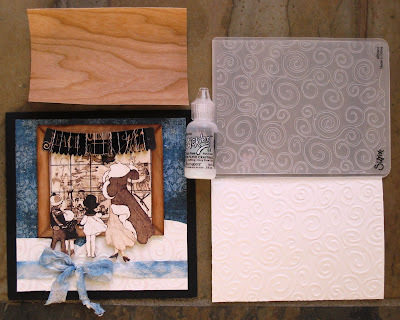 Off-white cardstock becomes swirly snow with a Tim Holtz “Swirls” embossing folder. This time I coloured the plain ribbon with Stormy Sky Distress Ink. 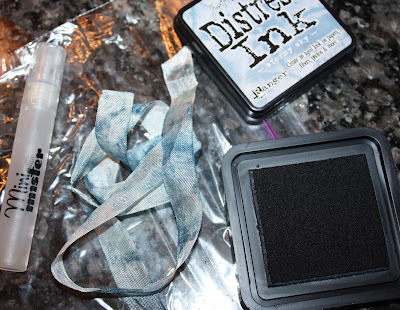 To do this, you press the ink pad randomly on the ribbon (I didn’t want solid coverage, so I missed some spots), put it in a plastic sandwich baggie, mist with water, then crumple and let dry. Voila! 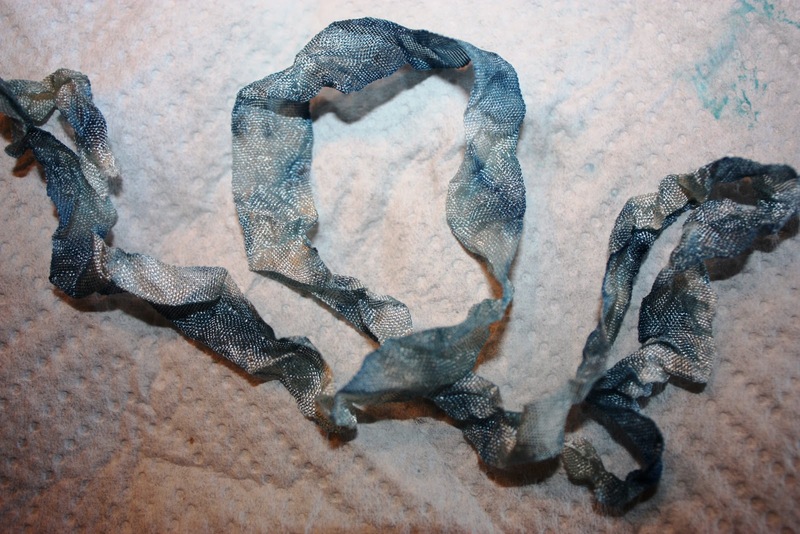 A lovely vintage blue ribbon is born! 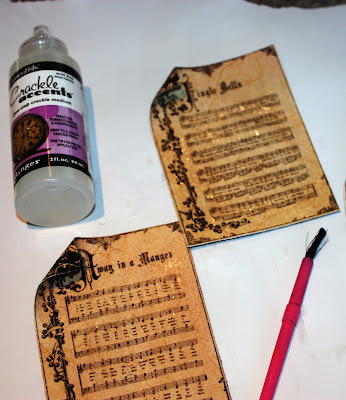 To age the carol music paper pieces, I used Crackle Accents and Walnut Stain Distress Ink. With a paint brush, add a medium thick coat of Crackle Accents and let dry completely, about an hour or more. 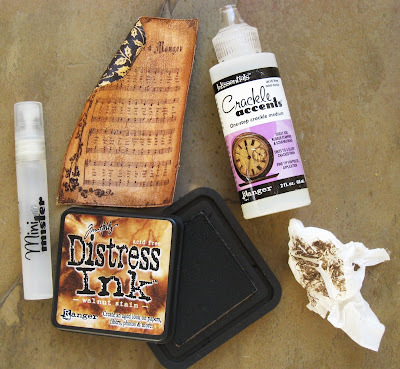 When the Crackle is dry, ink the whole surface with Walnut Stain, mist with water and wipe off with a tissue or paper towel. The dark ink stays in the cracks, making them more visible. Now you have beautiful vintage music paper! 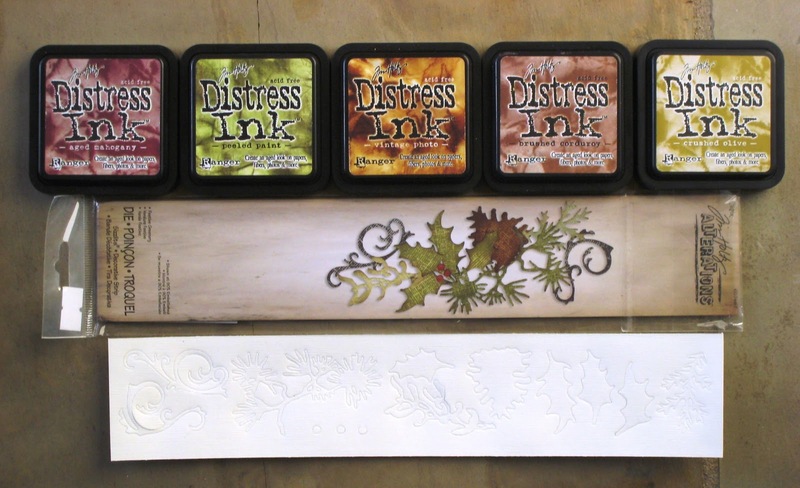 The die cut elements are from the new Tim Holtz Festive Greenery Sizzix die…..
….and then transformed them with a variety of Distress Inks….magical! All the inked pieces and a small paper rosette are adhered to a piece of black cardstock and sprayed with Perfect Pearls “Heirloom Gold”. 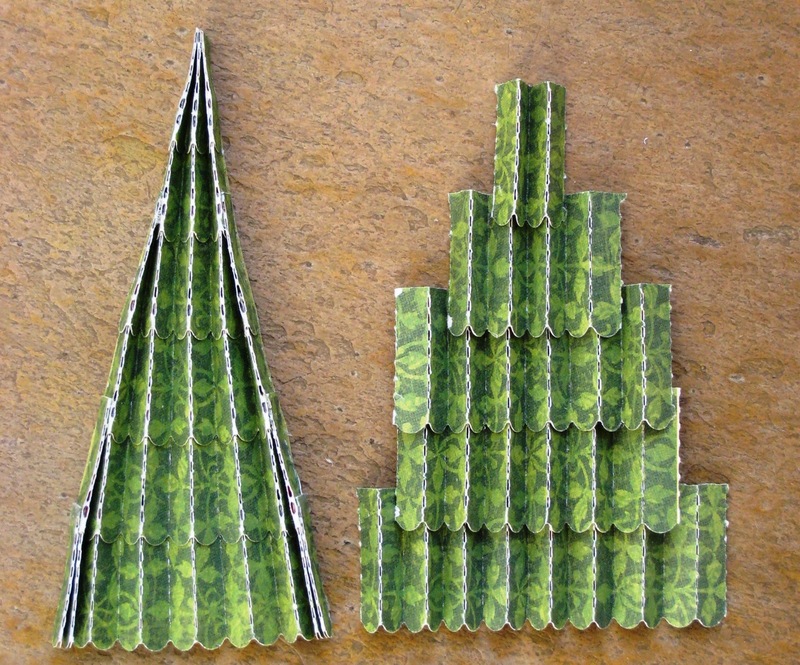 I love this Festive Greenery die…so pretty and versatile! TIP: Ink all the pieces before you assemble and layer into a tree. 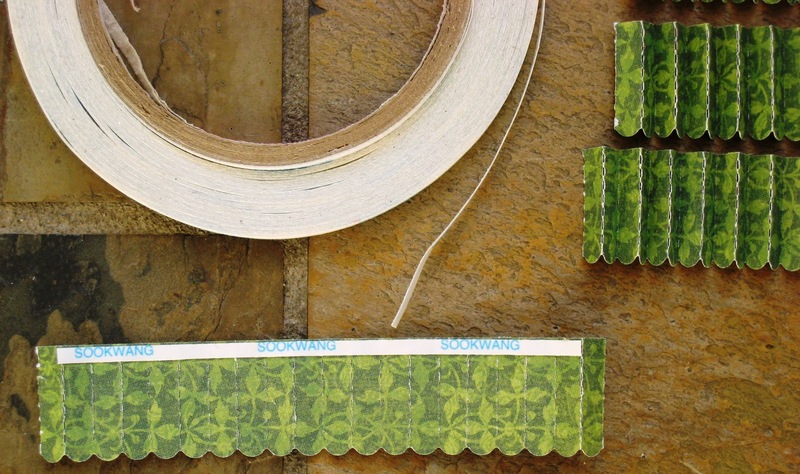 Sookwang tape is the best adhesive to adhere the tree layers together. Stack up your layers and adhere along the accordion folds. 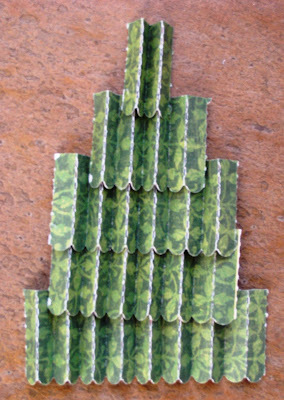 Adhere the sides of the tree rosette pieces so they lie flat and you get a tree shape. 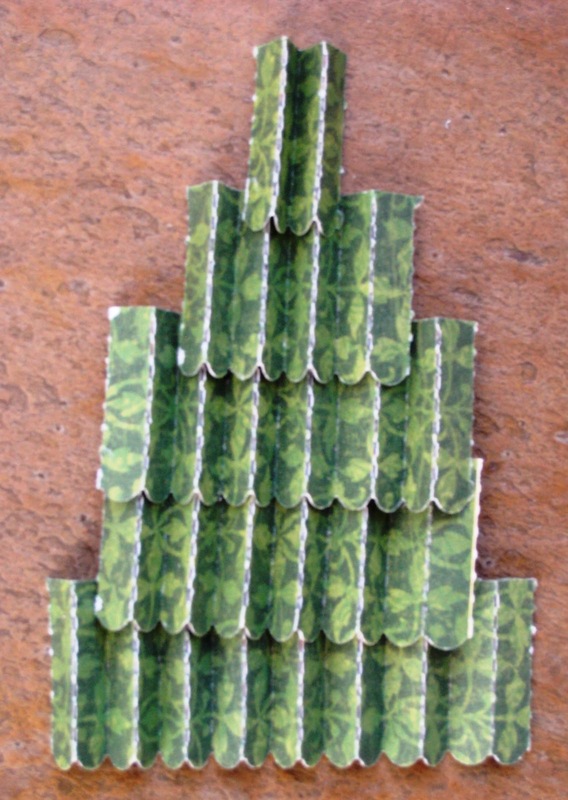 Also, I cut a 4″ x 2″ triangle shape to use as a base for the tree…adhering the rosette tree to a base will stabilize it and help it keep a nice shape. Oh, and the tree trunk is a little strip of real Wood Veneer paper inked with Walnut Stain. Side angle of flattened sides of tree. 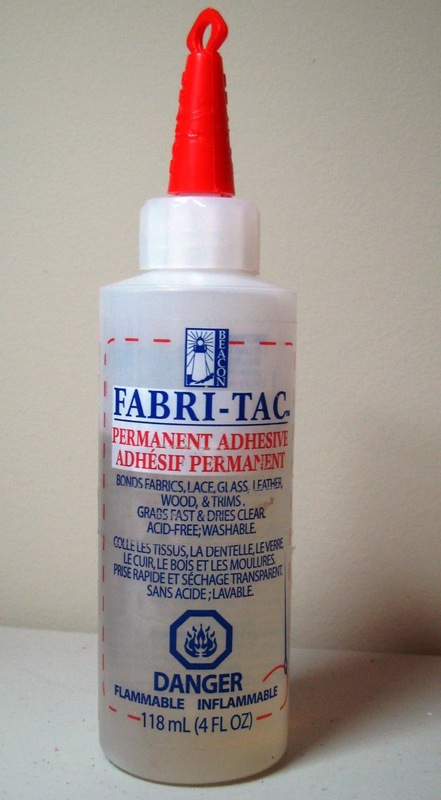 Fabri-Tac liquid adhesive by Beacon Adhesives is wonderful for this because it dries VERY quickly. 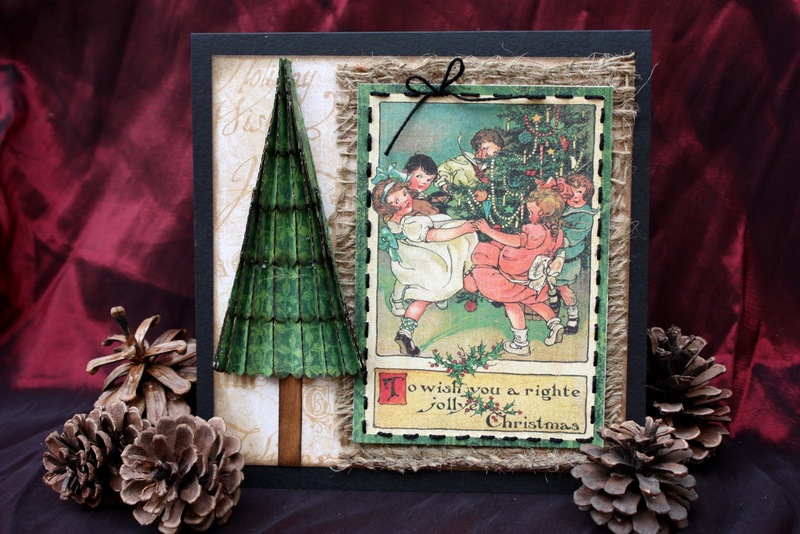 And my early Christmas present to you….if you comment on this post and are a “Follower” of my blog, you will be entered to win a kit to make ALL these cards!! I’d also love to hear which card is your favourite 🙂 Thanks for visiting! Woow girl,what fabulous cards you made all are so very pretty!!!! Fabulous work! Holy smokes Kelly ! these are frigging GORGEOUS! I can NOT believe how many techniques you have incorporated in these cards! 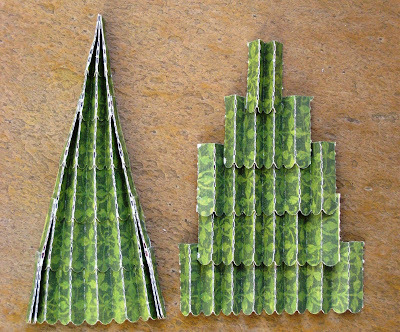 Seriously!And while you know the window /blue one is my fav , I gotta tell you that the way you used the rosette die cut to make that Christmas tree is astounding. 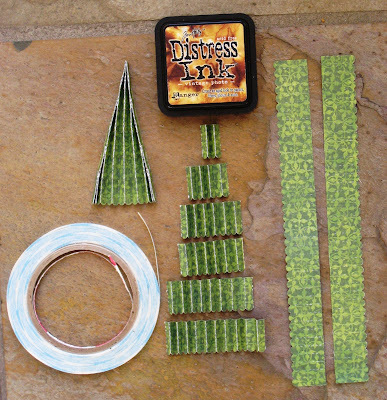 It amazes me how you keep coming up with unique ways to use these products..YOU should send that one to Tim himself…I bet he’d be mighty impressed with that use for his diecut! Outstanding work my friend! Wow! Talk about impressive! It never fails to amaze me how many different techniques you use to create. I can’t wait to soak up some inspiration from you! What beautiful cards. You must be so proud of how you challenged yourself and came up with such a magnificent result. Michelle’s idea is brilliant – Tim would love to see what you have come up with! Geez Kelly, you’re not a cardmaker?! Could’a fooled me:D Your creations are stunning and all so different incorporating so many cool techniques!! Tfs! Kelly, All five of these cards are unbelievably adorable. I have shared this post on the Graphic 45 Facebook business page. Our followers are going to love this. Thanks for sharing your great techniques. THOSE are gorgeous creations! Creative juices were overflowing, too. Awesome cards. Just beautiful. Now I need to go shopping to be able to scraplift. Thanks for sharing! Beautiful! I love how you used the rosette dies so creatively! Wow! Double wow! Love all of your cards. Thanks so much for sharing. Wowza,I am so glad I found your gorgeous cards! Fantastic work. It makes me want to go get inky. OMG!! These are fantastic! I can’t say which is my favorite because I love them all. Wonderful job! 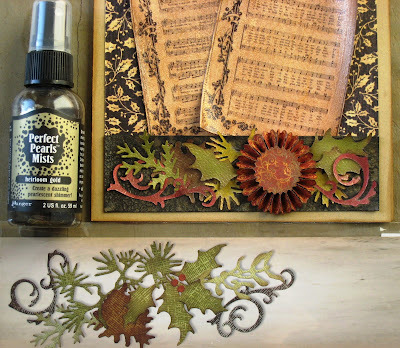 Fantastic cards, what great ways to use the rosette die. I’m actually sitting putting some rosettes together right now! Great creative ideas to use Rosettes in so many new ways! Thanks for the jumpstart! I love wishful window if we really need to pick just one. Awesome cards. Beautiful cards. I am now a follower. Can’t wait to try some of these techniques. Thanks for sharing your wonderful talent. Kelly! I didn’t realize what a “Star” you are!!! I love these cards. Thanks for showing us all of your tricks to make them. 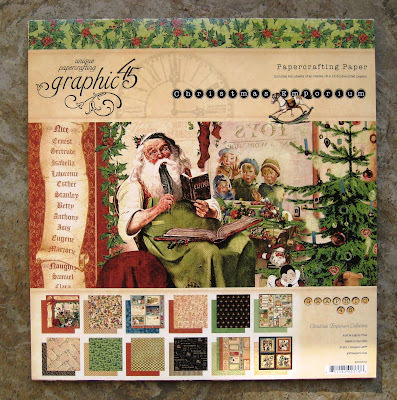 Gotta love Graphic 45…everything! What imagination you have and I’m so excited with the Santa with kids art and teh idea for the tree is wonderful. Love your ideas! Thank you for sharing your artwork and for a chance to win. 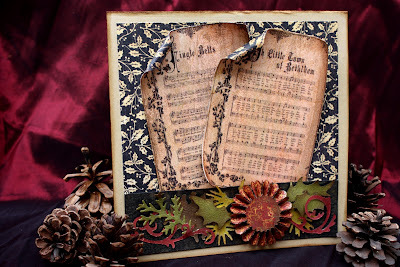 Hey Kelly, I came to this via Facebook’s Graphic 45. . . beautiful cards. Very professional! Kelly, my jaw dropped when I saw your beautiful creations. Sure puts my cards to shame. Now I have to work harder to make them almost as nice as yours. Thank you for sharing! And I agree, you have to let Tim know about the Tree! Totally awesome!! Love your designs. And the techniques are GREAT!!! Thanks for the inspiration!!! Wow! These cards are just gorgeous! 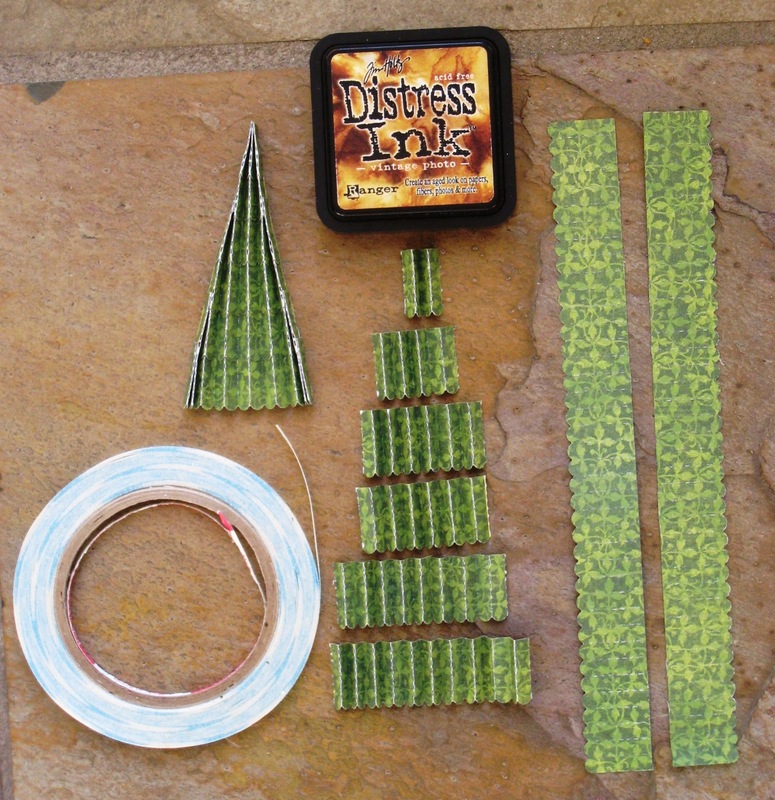 I love how you used the papers and the dies. Great stuff! I like the first one the best — I really like the brick wall! wow!! Hallmark should be calling you!! what beautiful cards!! it’s hard to decide which is my favorite, but i think i like the Joy card the best. and, i really like how you share your techniques!! even Ms 5 thumbs, like me, can give this a whirl! thank you for sharing such wonderful ideas. You Rock!! I think the Christmas Carols card totally ROCKS!!! but wowzer! they are all AWESOME! Stunningly amazing cards! You are an inspiration, the blue window is my favorite! I love the JOY tag card – but it was hard to chose just one as they are all very vintage Christmas. Thanks for the tips and inspiration. These are just beautiful and so inspiring!!! Not a cardmaker – WHAT??? These are all simply amazing! My very favorite is the first one–love the wreath! These are Great,the forth card is my favorite,since I had to pick one! Love them all!! Your cards are simply amazing! I love how you incorporated so many techniques in each card. The first one blew me away…by the time I saw the last, I was literally speechless. Thanks so much for sharing! You are very creative!! I love the card with the music paper and the look you gave it. I also like the Christmas tree. So much fun. The mother with children looking into a store window is my fav – love how you used Stickles on the swirls – and that blue distress ink – I neeed me some of that. Right after I finish this, I’ joining your blog – you have used almost all of my favorite products in your post today ! How cute. Don’t you love Graphic 45? Thanks for sharing. Very Nice!! 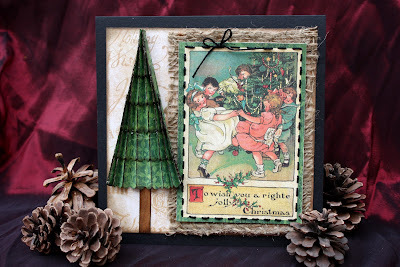 I like the first one, the Santa with the embossed backgrounds – just lovely!! 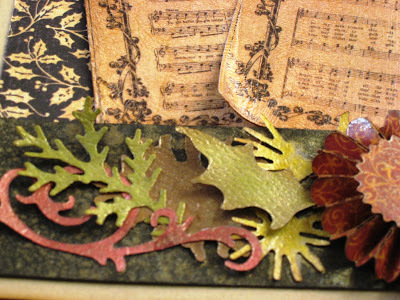 OMG, I am not a card maker but am soooooo inspired to try a few of these techniques. Love the Santa’s knee one but all gorgeous. I recently started using that glue too – LOOOOOVE it! I enjoy making cards but mine are nowhere near as good as this!! I think my favourite is the tag card, but they ar e all stunning. I love your cards! Following you now & can’t wait to see what else you create. These are stunning. Love all of the great looking Vintage Cards! Love this paper pack. These are so beautiful! So very hard to choose a favorite, but I guess either the first or second, but really they have all given me ideas! I am your newest follower! I found you from a post on Graphic 45’s Facebook page. I love every single card you made! Brilliant! I am especially fond of on Santa’s knee! These cards are marvelous!! My favorite is the ‘Christmas Carols” one. i love your innovative use of the embossing folders and of course the Tim Holts dies. Wonderful work!! now thATS THE WAY TO USE TIMS STUFF. I AM SO SICK OF PEOPLE BUYING ALL THIS STUFF AND NEVER USING IT. NOW YOU SURE USED ALL OF IT . SO CREATIVE YOU SHOULD BE SO PROUD OF YOURSELF.JUST GORGEOUS. I LIKE THE KIDS LOOKING THRU THE WINDOW LOVE THOSE STICKLES. Kelly these are absolutely amazing!!! I really love the rosette tree but they’re all just gorgeous! You’re so creative–Love it! Oh, sure, just a few simple cards…..These are works of art. Just amazing. You did Tim proud! So creative. The first card is especially exceptional. I couldn’t love these more. Beautiful, Kelly. Loved the tip, too, on using distress stains to color ribbon. I usually use mists, but I like the look of the stains better. Great job, too, with all the photos. Just wow. Kelley, I love all your cards, and my favorite is Christmas Carols! For not making many cards these are fantastic. 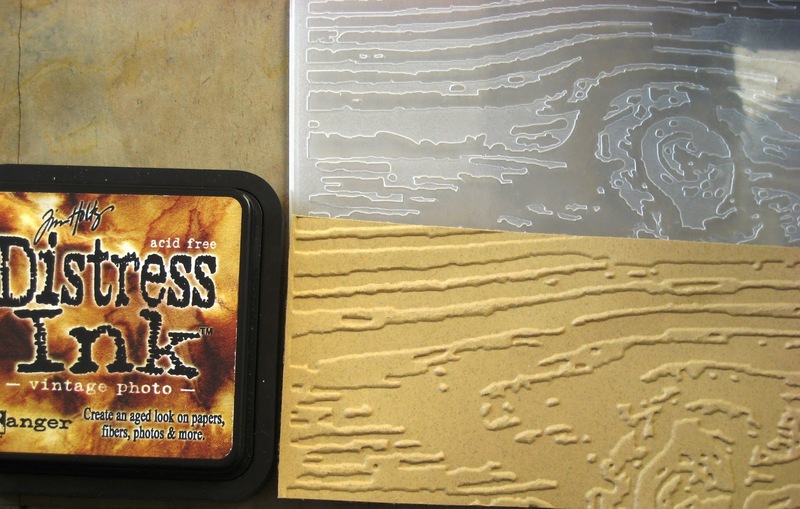 Tim’s products AND Graphic 45 are two of my favorites. Thanks for the inspiration. 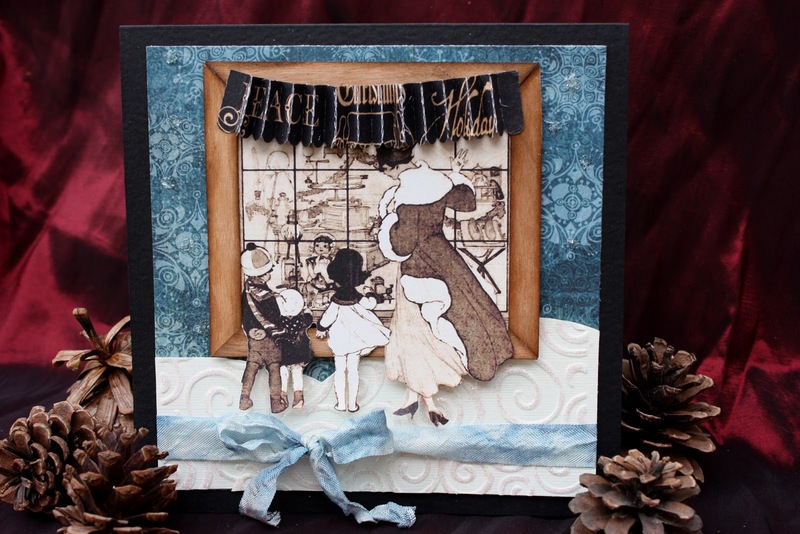 Kelly, all of these cards are so beautiful….cannot BELIEVE how much detail you added to each one! Maybe you should hand deliver each one….don’t know how the Canadian postal service is, but I would be scared to death to put it in the U.S. mail!!!! OMGosh!!! Love them ALL! BTW…after your comment….thanking me for my comments over at SB.com, I had to go back and see what I had written…..LOL…..you are so funny, honey bunny! I think these are amazing! I’ve probably missed your giveaway but just wanted you to know how outstanding I think these are. I’m here to deliver a cup of hot cocoa with tiny marshmallows. It is so hard to choose a favorite, they are all so pretty! But I think that the ‘Joy’ card is my favorite! crappy doodles! I totally thought I would never get to the end of your comments! Thank you so much for the how to’s…you are such an ispiration! that sounds a little overly sappy but it is the truth! Misty always makes me laugh with her expressions crappy doodles? I’m So gonna use that! I was gonna say YOWZA!!! 68 comments? Not even during a blog hop do I get so many comments! Goes to show- being talented AND sweet AND friendly counts- a LOT! Thank you for swinging by my blog today- it was a huge honor and I really appreciate the feedback. LOVE your card! 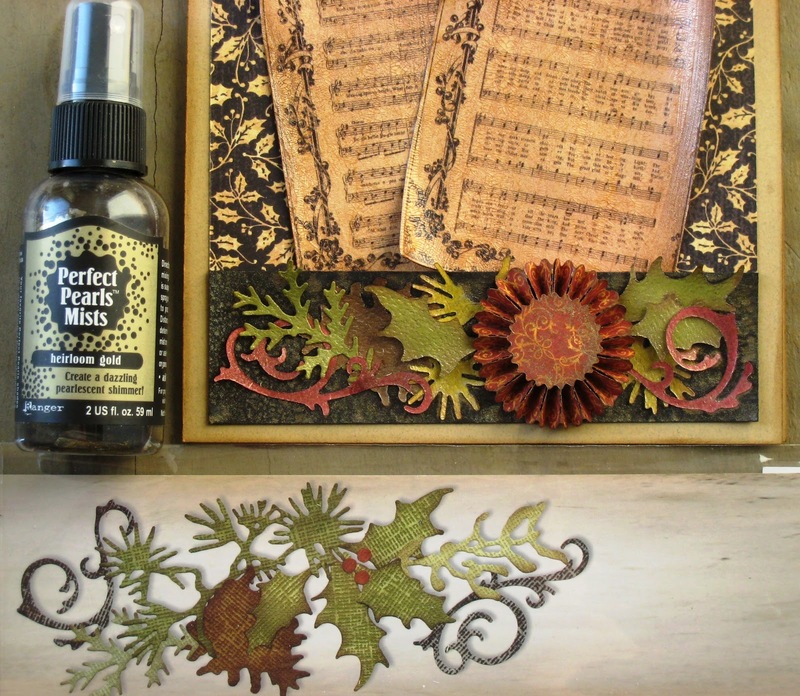 It’s FABULOUS- the woodgrain and brick embossing are so perfectly well thought out! Pinning it for future inspiration! OMG what pretty cards! 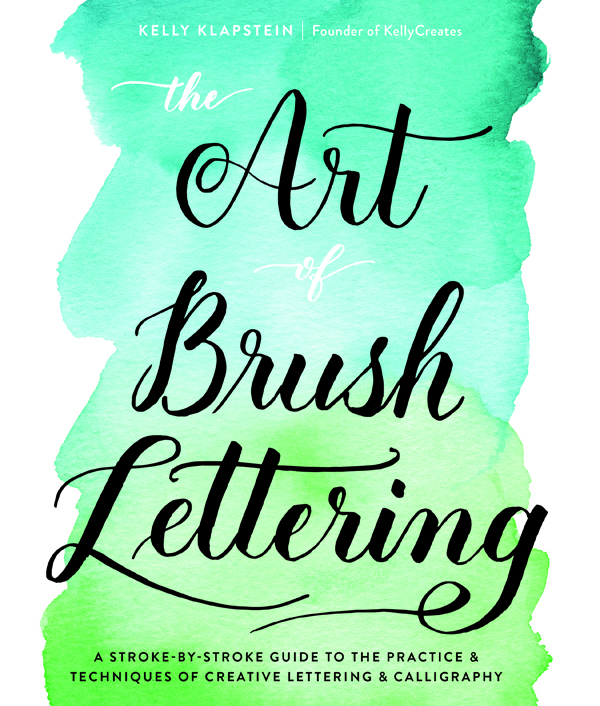 I love them all…so many little details to admire…I love how you share tips/tricks…they are all so perfectly thought out…beautiful work–lots of inspiration here! Wow, Kelly these are amazing! I am always in awe of what you come up with and I can’t thank you enough for always sharing how you came up with it! You have a wonderful way of thinking outside the box and coming up with new ways to use our supplies! Thanks Kelly… and I love each and every one of these beautiful cards! Gorgeous one and all…Thanks for the tutorials, too! Off to buy some Crackle Accents! WHOA! Number 76!!! Well O LOVE these cards!! The paper wreath and cubed hearth on the santa card are FABULOUS!!! I also like how you printed music notes on the wood- beautiful cards- you knocked these right out the park! Awesome cards, love them all! Thanks for sharing the techniques, I can’t wait to try some of them.